I must admit, I don't need Mother's Day to remember my mother. She's etched in my memory and heart forever. But I thought it would be good to share her with the world. (Yes, this is Mom and me in the photo). My biological mother passed away from a rare infection two weeks after I was born. At the same time, a woman named Adela, left Sweden to visit her two sisters in Israel. Adela was at a party where she heard about the widowed man and his two-week-old baby boy. She felt an unexplained urge to find and meet this man and his son. She did, the next day, and told me years later that "I just felt I needed to see you." Adela asked my dad if he would allow her to stay and care for me. They were complete strangers, but for some mysterious (and lucky) reason, he said yes. A year later they were married and Adela officially adopted me. I have the adoption papers and they have always symbolized for me what a love and sacrifice are all about. Imagine visiting a foreign country (she did not speak Hebrew) on a tour, meeting a widowed man with an infant child, then deciding to take care of that child and never going back to the US? Literally, leaving your life behind and trading it for a strange country, new language, culture, a suspicious family and a whole lot more. People often wonder why I have a strong connection with my kids and a burning desire to help people? When you have a childhood filled with love, devotion and the type of motherhood I experienced, you emulate your mother. As I was growing up, my mother would drop hints like " I love you more than a mother would". I had no clue why she said that until the day my father sat me down to tell me. I didn't know how to react, I was twelve years old. I remember saying to myself, "I have a mother." Years later, I realized my mother was right about "loving me more than a mother would." She was right. She had to prove herself under the watchful eyes of a family that wasn't accepting of the "stranger" that walked in and raised me. My mother and my father were very different. My father came from a small village in Poland and was poor most of his life. My mother was worldly, loved classical music and was a people-person. Adela was a Holocaust survivor destined to die on a "gas-train" but was able to breathe through a crack in the floor while everyone else was dying on top of her. Thrown into a mass grave, she escaped into the woods and managed to make her way to a major city, living in sewers and ultimately was reunited with her brother in Sweden. My mother never revealed to any of us how old she was. She would drop occasional hints " I wish I could share with you and your father how old I really am". The date of birth on her passport was made up because, after the World War, survivors were allowed to "declare" their age. My babysitter was the only one who knew my mother's real age and would only share that date with me after she passed - She was (her true age) fifty-two when she adopted me. 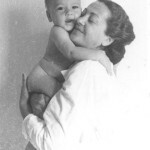 I was certainly a handful like many boys are; Mom was also not well from her experience during the Holocaust. She shared very little with me and none of us knew the internal pain or turmoil she endured privately. Amazingly, my mom had unending energy reserves fueled by what she considered was the special gift she was given by being my mother. She passed away at the age of ninety-three. I always pride myself on being resilient but when my mother passed away I fell apart. I was devastated by the gaping hole that her passing in my life - I was a grown man with children of my own which made me realize the depth of her sacrifice and the power of her devotion to me. We take so much for granted as we grow up and never imagine that it would end one day. Yes, my mother was right - she was much more than just a biological mother and spent her life proving to everyone else that it is possible to love a child as your own regardless of the circumstances that brought us together. I am not sure whether Adela came into my life because of divine intervention or "luck". She always considered herself lucky and so do I. You can choose to believe that things either happen for a reason or they occur randomly, but in my case, I choose to cherish the stranger who gave up everything in her life so I can have mine. Each year on my birthday, I thanked my mother for being in my life. She left me with memories of a great childhood and as a role model for selflessness and devotion. Mother's Day is a painful reminder of how much I miss her. Happy Mother's Day Mom.